The most important thing in sprouting right now — that which the entire future of fresh sprouts in the USA under the governance of the FDA hinges on — is food safety. Food safety has taken front seat and for good reason ... A number of retail chain buyers have dropped sprouts because of food safety concerns. Sprouts do present an unique challenge in food safety. But, not one that cannot be met. Enter the Emerald™ Purifer Sprouters. Our patented Emerald™ effectively addresses the underlying food safety risks associated with sprouts. However, it also means that the rotary drums currently in use by sprout growers suddenly have become near obsolete. Furthermore, they have unfortunately become part of the food safety problem associated with sprouts for a number of reasons. The patented Emerald HD3200 process effectively kills pathogenic bacteria that can be hidden deep inside the microscopic fissures of seed. The process also fortifies the sprouts with natural defenses against post-process contamination. The end product is sprouts that are tasty, unadulterated, safe and wholesome. To rely on outdated method will only bring expensive headache later on. 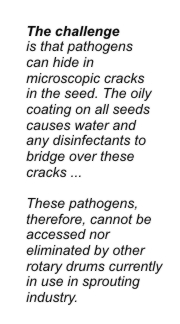 The ONLY way to get rid of the embedded pathogens INSIDE the seed shell is by flushing the inside of the hull repeatedly with disinfectant solution at the moments it changes, absorbs, opens, "morphs," to become sprout. A persistent full-submersion washing process MUST occur during a certain duration of the sprouting process. This includes the wee hours of the night when no one is going to be pulling the product out to wash it again and again (plus adding more contamination to boot). The patented Emerald™ HD-3200 effectively kills pathogenic bacteria that can be hidden deep inside the microscopic fissures of seed. Our process also fortifies the sprouts with natural defenses against post-process contamination. The end product is sprouts that are tasty, unadulterated, safe and wholesome. With Emerald™, you will get the perfect, purified sprout. Best of all, Emerald™ does it all automatically even while you sleep. You can use the Emerald™ to disinfect and grow the sprouts from start to finish. Or use it as seed/sprout purifier. Whether you are doing regular sprouting or using it for sprouted grain products, e.g., sprouted grain bread, sprouted flour, sprouted cereal products, with Emerald™, you will have the peace-of-mind, knowing that you are using the best known method for both food safety and product quality. Full-featured, Emerald™ Purifier Sprouter is unlike any other rotary drums to-date. More than double the capacity of competitors' and the only patented technology to ensure the safety of your sprouts, our Emerald™ is bilingual and comes with loads of advanced features and add-on options that other rotary drums just cannot handle. Complete-submersion seed & sprout disinfection alternated with drainage. Economical — uses minimal water and energy. Handy tilt-back positioning for loading seed. Economical tilt positioning mechanism utilizes standard, of-the-shelf air cylinders rated at millions of cycles. Sanitary, easy to clean construction. Please contact us for complete list of Emerald™ advantages.